Announcement This husband and wife team uses spray and handmade custom stencils to transform vinyl records, sheet music and travertine tile into functional and decorative works of art. 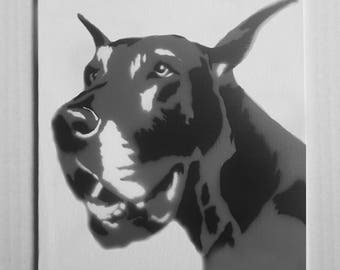 Our spray paintings make for unique gifts for all occasions: weddings, baby showers, birthdays, anniversaries, holidays, arbitrary gifts. Welcome to our shop and thank you for viewing our artwork! ***EFFECTIVE January 13, 2018: We have discontinued our line of celebrity spray paint artwork. Any celebrity artwork will be made on a commission basis. We apologize for this inconvenience. Six years ago we thought of a creative and unconventional way to repurpose scratched or very loved, yet unplayable vinyl records by turning them into pieces of art with just a little spray paint. 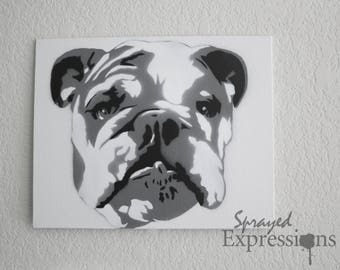 We combined this medium with our love of timeless musicians/vocal artists, and that's how Sprayed Expressions began on Etsy. 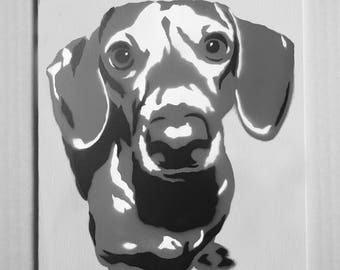 It has been our desire to transition from celebrity art to focus more on cityscapes and on commissions of pets, family and wedding spray paint art. So after six years, we are rebranding our business to better align with our passion of working closely with you, our customers, to create one-of-kind, thoughtful art. This husband and wife team uses spray and handmade custom stencils to transform vinyl records, sheet music and travertine tile into functional and decorative works of art. 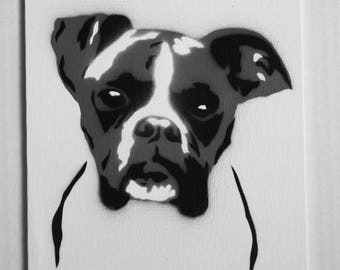 Our spray paintings make for unique gifts for all occasions: weddings, baby showers, birthdays, anniversaries, holidays, arbitrary gifts. Turned out perfectly! Picture says it all. Thanks again!! Sivian does beautiful work. My custom order turned out beautifully and will make a great holiday gift for family. This was a great gift! Really creative and I was very happy with how quickly it got here. The sellers were also extremely nice. We've gone retail! Now you can find a great selection of our spray painted record art and magnets at Austin Gift Company in Austin, TX. Sprayed Expressions' record wall of fame at America's Largest Christmas Bazaar in Portland, Oregon. The paintings that started it all! 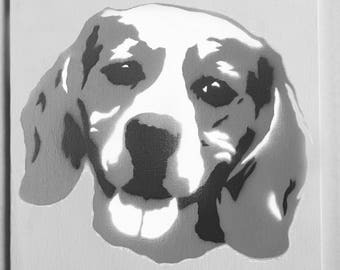 Sprayed Expressions, led by husband and wife team uses spray paint and handmade stencils to transform vinyl records, sheet music and travertine tile into functional and decorative works of art. We give them new life and prevent them from ending up in the landfills. 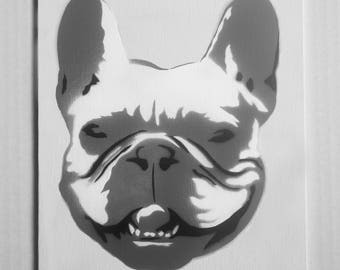 Our spray paintings make for unique gifts for all occasions: weddings, baby showers, birthdays, anniversaries, holidays, arbitrary gifts. Hi there! We're Josh & Sivan, the artists behind Sprayed Expressions. 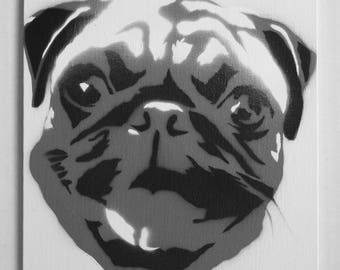 We specialize in vinyl record spray paintings, photo to canvas spray paintings, custom spray paintings, sheet music spray paintings and spray painted wearable art. 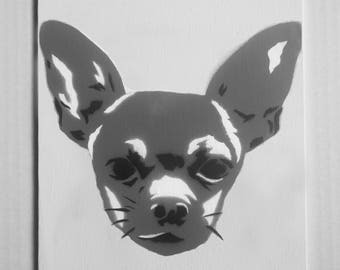 Our spray paintings are unique, often one-of-a-kind, and perfect for your gifting needs: weddings, baby showers, birthdays, anniversaries, holidays, arbitrary gifts. Thank you for stopping by and viewing our artwork! Except for custom orders, returns or exchanges may be accepted on RTS (ready to ship) paintings within three (3) days of receiving your package. A 25% restocking fee (of your total invoice) will be assessed. The item must be returned in the original condition in which it was shipped and you (the customer) are responsible for return shipping fees. Custom orders are not eligible for refunds or exchanges. With that said, you should feel delighted with your purchase. We will make every effort to ensure that you are in love with your custom painting prior to shipping it out. Upon completion, a digital photo proof of your finished product will be sent to you via an Etsy message, and you will need to review, approve/request revisions via the same Etsy message. If no approval or revision is received from you within 48 hours, the custom order will ship as is. Please see Custom Order Shipping Policy for more information. We accept most major credit cards, PayPal*, and Etsy gift cards at this time. Payment in full must be made on all orders before they are created and/or shipped. *PayPal: You DO NOT need to have an account with Paypal to use them. Choose the PayPal option during checkout directly from this shop. Submit your order, then click the "Pay Now" button. Scroll down and you will see the option to pay with a Credit or Debit Card WITHOUT having to sign up for a PayPal account. CANCELLATION POLICY: If your payment has been made but the product has not been shipped, a full refund will be granted (excludes custom orders). If your product has been shipped, please see Refund Policy. CUSTOM ORDERS: For all custom orders, you will receive a digital photo proof of your finished product via an Etsy message, which you will need to approve within 48 hours (if no approval is received within 48 hours, your custom order will be shipped as is, and the Refund Policy will be in effect) via that same Etsy message. Once your approval has been received, your custom order will be shipped out within three (3) business days (except holidays). RTS (ready to ship) paintings: All RTS paintings (all paintings which do not involve customization) are mailed out within three (3) business days (except holidays) of when your payment is received. A payment in full is required before your product is shipped. All orders are shipped via USPS First Class mail unless you have previously arranged for expedited shipping with us. Upgrades to shipping are available at an additional cost; please contact us for more information. If you live outside of the United States, please allow 4-6 weeks for your order to arrive. Customs may hold package(s) for a lengthy period of time for which we have no control. Please be aware that the customer is responsible for customs' fees and or taxes. If your package is received damaged, we ask that you notify us promptly within 24 hours. We require photo proof in order to validate the damage. PLEASE NOTE: Sprayed Expressions is not responsible for items that are not received due to incorrect address information. In the event that Etsy and PayPal show different address information, your package will be shipped to the Etsy address. We love a custom order challenge! 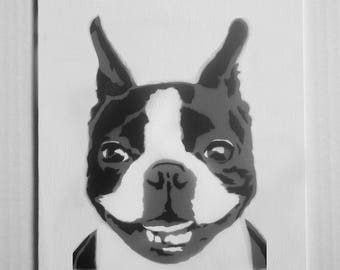 Custom orders can include anything your heart desires: self or family portraits, animals, city/landscapes, wedding photographs, names, business logos, etc. If you are interested in a custom order, please contact us. You may also find additional information regarding how our custom orders are handled under the Shipping and Refund Policy section. 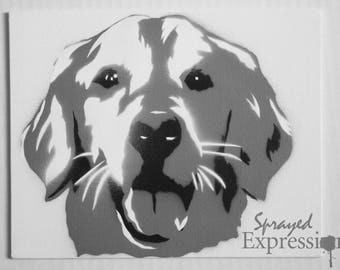 ***All custom orders can be used for promotional purposes by Sprayed Expressions unless specifically stated. Yes, we offer wholesale! Please contact us at sprayedexpressions [at] gmail [dot] com for information on our wholesale policies. Copyright © 2018 Sprayed Expressions, LLC. All rights reserved.